Well yesterday was the day to drive to the fair and pick up our chapter member's entries. Thank heaven the weather was kind this year. There are some years that it is broiling hot in the dusty rural area of Missouri. But this year the weather was delightful. High 70's, sunny skies and a nice breeze. That doesn't mean that the horse barns didn't still have an "aroma." As is always the case, we made our way to the home ec building first. That is what I came for after all. Not a bad showing. 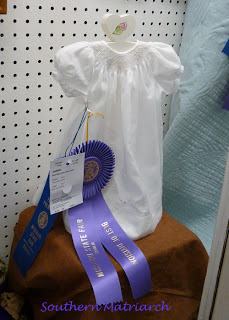 I had four entries this year and came away with four ribbons. Three blues and one white. Two of my blues were best of show for their division. Not too shabby. I will be real honest and say that the fact that both of my best of shows look as if someone slept in them. Aghhhh. I guess they had to be handled quite a bit for judging. It is just a killer when you spend so much time ironing it. I wanted them to be presentable when they arrived. 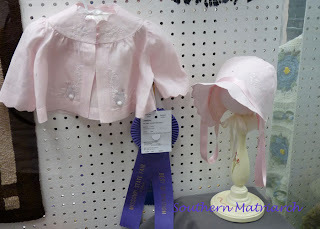 I laughed out loud when I saw the ribbon looped over the bonnet of the pink linen set. I guess someone thought that was the way it was supposed to be. Could be a trend I guess. In the top picture you can see a portion of the quilt that got the gold award for the home ec building. It was spectacular. It is a whole cloth quilt w ith millions of the tiniest hand stitches. If I had been thinking I would have gotten a picture of the whole quilt but here is a teeny portion. On to the next thing. What you are you sewing these days? Congrats Martha!! Your work is flawless and so pretty. But those ribbons are really pretty too! I am pretty obsessed with ribbons myself. Congratulations on your ribbons? I love your work, it is exquisite! sorry, I did not mean to put a question mark after the first sentence. 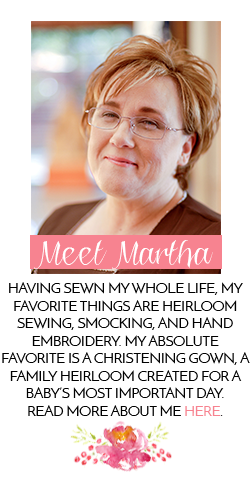 Congratulations on your wins, Martha! Thank you everyone. It was nice to get recognized for something I love to do. Congratulations on your well deserved wins!!! Yea!!! Congratulations on your ribbons and best of division awards! Congratulations Martha! 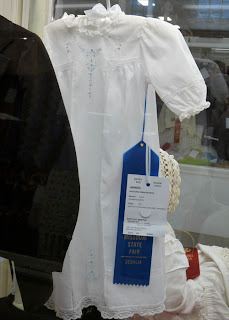 Beautifully made garments and gifts! Can I ask what pattern you used for the pink hat? It is adorable and I have a new granddaughter! Beautiful entries, thanks for sharing! Wow! We have come to expect nothing less than RIBBONS from you! Stitching on wee care gowns.....lace! Yikes!